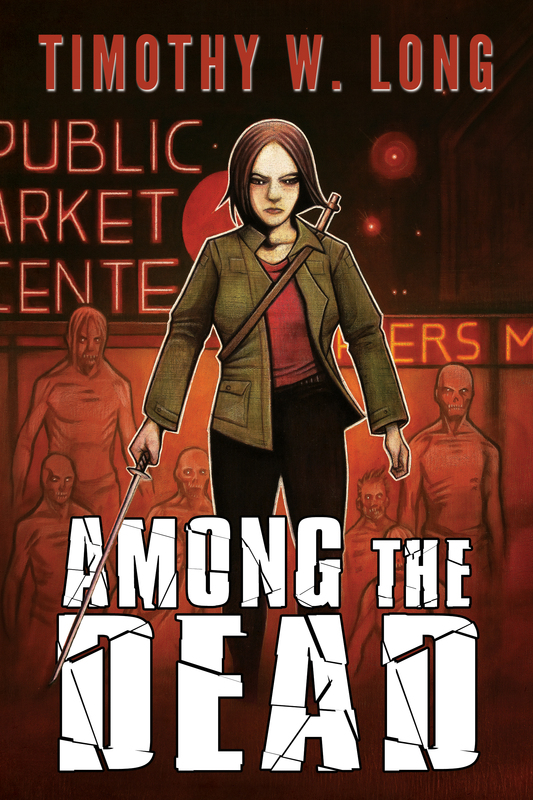 Timothy W. Long’s Among the Dead avoids creating heroes to battle the zombie hordes that surround Seattle. Instead he focuses on survivors struggling to find their place in this changed world. Mike, a reporter, and Kate, a serial killer of men now turned to serial killer of zombies, are making the best of the hand they’ve been dealt. With the military making all the decisions, entering the safe haven of a Seattle sports stadium means having to depend on someone else to protect them after they’ve managed to get themselves this far. Among the Dead distinguishes itself by avoiding portraying these survivors as being happy to give up their weapons and freedom in exchange for the expected safety of a fortified compound. Underlying the desire to be part of a larger group is the fear of losing independence and mobility. They question whether to trust the military to protect them or once again set out on their own. Mike and Kate aren’t the type to roll belly-up and return to domestication. They’ve transitioned into self-reliant survivors, always keeping one eye open for an escape route and the other one looking for trouble. Kate is a damaged creature and the zombie invasion might be the best thing that’s ever happened to her. No longer obsessed with the demons of her past, she now fights zombies and finds it a socially acceptable outlet for her rage. Kate isn’t content to stay within the safety of the sanctuary. She misses the wild thrill of being in a city increasingly overrun by zombies. Getting past the gates and killing is what fuels her. Mike, a reporter in his pre-zombie life, is prepared to defend himself, but content to stay in the fortified part of the city. Even so, he keeps vigilant and finds meaning in relying on his reporting skills to interview and question fellow survivors. His knack for asking questions and being observant pay off as he discovers a mysteriously named project that may be the key to leaving the stadium. Fast paced action, more than a few surprises, and a sympathetic serial killer makes this a solid read. Even without reading the first book in the trilogy, Among the Living, a reader can jump right into this one. Long does a great job of giving us hints of back story, without drowning us in all of the information contained in the first book. Among the Dead didn’t give me nightmares, but it did give me some great characters that I look forward to seeing in his next book. Check out Among the Dead at Amazon. If you want to start with the first book, Among the Living is available at Amazon, too.